Several major vascular tissues, such as the aorta-gonad-mesonephros región (AGM), yolk sac, and fetal liver have been confirmed to possess hematopoietic function. Recently, the placenta has been demonstrated as another hematopoietic organ. However, it is not conclusive whether the placenta possesses hematopoietic ability. Therefore, we undertook a series of experiments to study the hematopoietic functions of placenta. Fetal blood circulation in the placenta is difficult to be eliminated and its interference in the study of placental hematopoiesis is inevitable. With the application of placental flushing, fetal blood contained in the placenta was eliminated. We then made the further study of placental hematopoiesis after the El2.5 placenta was flushed. Our studies showed that placental cells expressing Sca-1, CD117 and CD34 were mainly restricted to the embryonic vessels of E12.5 placenta. The results of fluorescence activated cell sorter (FACs) analysis and colony forming cells (CFC) assay demonstrated that both placenta and placental blood contained hematopoietic stem/progenitor cells (HS/PCs), including CFU-GMs, CFU-GEMMs, BFU-Es, and HPP-CFCs. The frequency of HS/PCs in the placenta was 2-3 times that of placental blood. Therefore, it is necessary to clear placental blood out of the placenta in the studies of the hematopoietic potential of placenta. The placenta still possessed the hematopoietic potential after the fetal blood is flushed out. These observations provide further evidences that the placenta is a hematopoietic organ, as has been proposed for other embryonic hematopoietic sites. The ontogeny of the hematopoietic system in vertebrates is characterized by sequential activity of distinct hematopoietic organs. Coordinated activities of the different hematopoietic sites ensure both rapid production of differentiated blood cells for the embryo's immediate needs and the establishment of a large pool of undifferentiated hematopoietic stem cells (HSCs). Yolk sac, fetal liver, thymus, spleen and bone marrow have been identified as the organs carrying out this function in mammalian embryos. Recently, a series of studies have suggested that the fetal placenta is also a hematopoietic organ that plays an important role in establishing the HSC pool during development. The study by Alvarez-Silva and colleagues shows that the placenta contains a high frequency of multi-potential colonogenic progenitors, before liver colonization initiates (Alvarez-Silva et al., 2003). Furthermore, subsequent in vivo studies show that midgestation placenta also harbors a large pool of pluripotent HSCs that have the capacity to self-renew and repopulate the entire hematopoietic system in irradiated adult hosts (Gekas et al., 2005; Ottersbach and Dzierzak, 2005). These studies have established the placenta as yet another hematopoietic organ that plays an important role in HSC development. However, the aforementioned studies do not give clues to whether the placenta is simply a colonization site (like the fetal liver), or whether it is also a source of hematopoietic cells. The studies of Zeigler et al (2006) and Corbin et al (2007) demonstrated that the two precursors of the placenta, the allantois and the chorion, possessed hematopoietic potential before their fusión into placenta. Thus, it seems the placenta maintains its hematopoietic potential from its formation to the midgestation. However, previous studies have shown that the vasculature system of the placenta is established several days after the formation of placenta, and that umbilical blood contained a high percentage of HS/PCs. These facts make it unclear whether the hematopoietic potential of the midgestation placenta was from placental cells, or from fetal blood, or from both. Consequently, we developed the technique of placenta flushing to clear fetal blood cells in the placenta before making further study of placental hematopoiesis. C57BL/6 mice were mated overnight, and the day of vaginal plug was considered as day 0.5 of embryonic development (E0.5). The animáis were housed according to institutional guidelines, with free access to food and water. Animal procedures were carried out in compliance with the Standards for Humane Care and Use of Laboratory Animáis. Pregnant females of El2.5 were killed by cervical dislocation. The uterine was removed from the conceptuses, washed extensively in D-Hank's balanced salt solution. The uterine was opened and embryos at E12.5 were harvested. The entirety of embryo, umbilical cord and placenta was maintained intact. Placenta flushing was performed immediately after the embryos were removed from the uterine. Under a stereomicroscope (Olympos, JPN), the umbilical artery and vein were identified by the direction of blood flow. A fine needle (BD29 G) was inserted into the umbilical artery with the tip pointing to the placenta. Heparin saline (concentration 0.5 mg/ml, 290000 IU/ml) was used as flushing fluid and injected into the umbilical artery slowly (O.lml/min) to flush the embryonic vessel system of the placenta. The flushed blood from the placenta was collected for the further assay. To quantify and determine the flushing effect, thirty placentas were collected and divided into six groups at random. In the six groups, the volumes of flushing fluid used were 0 mi, 0.05ml, 0.10 mi, 0.15 mi, 0.20 mi, and 0.25 mi, respectively. Then the placentas were serially cryosectioned coronally at 10μm. One slice in every ten serial slices was collected and total 20 slices for each placenta were harvested to evalúate the flushing effect. After hematoxylin-eosin staining, ten visual fields (x400) were selected randomly for each slice. Then the fetal blood cells in the embryonic vessels were counted in each visual field and the data were recorded for statistical analysis with the one-way ANOVA, using the SPSS software package (SPSS,USA). Placentas of El2.5 were dissected from maternal tissue. Frozen sections (10 μm) were collected on plus slides and were fixed by acetone. Slides were then stored at 4 °C, until ready for use. The sections were incubated with rat monoclonal anti-mouse CD34 (Serotec, UK), CD117 (Biolegend, USA), and Sca-1 (Biolegend, USA) for 1 hour at 37 °C. The sections were incubated for a further hour at room temperature in fluoresceinisothiocyanate (FITC)-labeled goat anti-rat IgG (KPL, UK). A negative isotype matched control was prepared by replacing the CD34 primary antibody with PBS with the same concentrations as those of the primary antibodies. A positive control section of mouse fetal liver was included in each batch of staining. To functionally assess hematopoietic activity of the flushed placenta, the placentas (free of umbilical cord, remnants of the yolk sac and maternal decidua) were dissected and dissociated into single cell suspensión. The placentas were mechanically dissected free and drawn through a 16 G needle and incubated with 0.1% collagenase in 10% fetal calf serum (FCS) / phosphate-buffered saline (PBS) for 30 minutes at 37°C and trypsin for 10 minutes at 37°C. Then the Percoll (Amersham, UK) fluids of different density (1.10/ml, 1.080g/ml, 1.055g/ml) were added into the centrifuge tube one by one from higher density to less, and then the cell suspensión was gently placed at the utmost upper layer. After centrifugation for 25 minutes with 2000 rpm, the cells residing between the top layer and the middle layer were harvested. The purified single cell suspensión was counted and viability was tested via Trypan blue exclusión criteria. Meanwhile, the flushed blood cells from the placenta were prepared and treated according to this procedure. All antibody stainings were carried out in a volume of 100-200 μl PBS/10% FCS on ice for 30 minutes with the following antibodies (Biolegend, USA): anti-CD34-PE, anti-CD117-PE, and anti-Sca-1-FITC. Labeled cells were finally washed twice in PBS, and filtered through a nylon mesh screen to remove debris. The cells were analyzed using a flow cytometry (Beckman Coulter, USA). The data were analyzed using the System II versión 3.0. Each valué was obtained from the means of six independent experiments. To determine background levéis, cells were stained with fluorochrome-conjugated immunoglobulin isotype controls from Biolegend. For analysis of progenitor activity in the E12.5 flushed placenta, 105 purified single cells were plated per 35 mm dish in MethoCult M3434 methylcellulose media (Stem Cell Technologies, CAN). The commercial médium contains methylcellulose in IMDM [15% fetal calf serum (FCS), 1% bovine serum albumin (BSA), 104 M 2-mercaptoethanol, 2 mM glutamine, 3 U /mi recombinant human (rh) erythropoietin, 10 ng /mi rh interleukin 6 (IL-6), 10 ng /mi recombinant mouse (rm) IL-3, 50 ng /mi rm Stem Cell Factor (SCF), 10 mg /mi rh insulin and 200 mg /mi human transferrin (iron saturated)]. After 14 days of culture at 37°C in a humid atmosphere containing 5% C02, colonies were identified based on their morphology under an inverted microscope and scored. Each valué was obtained from the means of six independent assays. To check for the presence of long-term HPP-CFCs, first passage colonies with a diameter exceeding 0.5 mm were plucked after 20-25 days of culture, pooled and washed with PBS. Cells were counted and 105 cells were replated per dish in MethoCult M3434 médium. The colonies were replated three times according to the same protocol and scored 60 days after initial seeding. The unflushed placenta was full of fetal circulation blood. After flushing, fetal circulation blood was cleared out of the placenta (Fig 1A). Under microscope, we found fetal blood cells that were previously trapped in the embryonic vessels (Fig 1B) had been completely flushed out of the placenta, and placenta flushing caused no expansión of the vessel lumina. The structure of endothelial cells of the embryonic vessels and other cells still remained intact and the tissue space was normal (Fig 1C). The relationship between the flushing volume and the flushing effect is shown in Fig 1D. The results of statistical analysis demonstrated that the differences between the first five groups(0 mi, 0.05 mi, 0.10 mi, 0.15 mi, and 0.20 mi) were significant (P<0.05), while the difference between the last two groups (0.20 mi and 0.25 mi) was not statistically significant (P>0.05). In our subsequent experiments, we flushed each placenta with 0.2 mi flushing fluid. 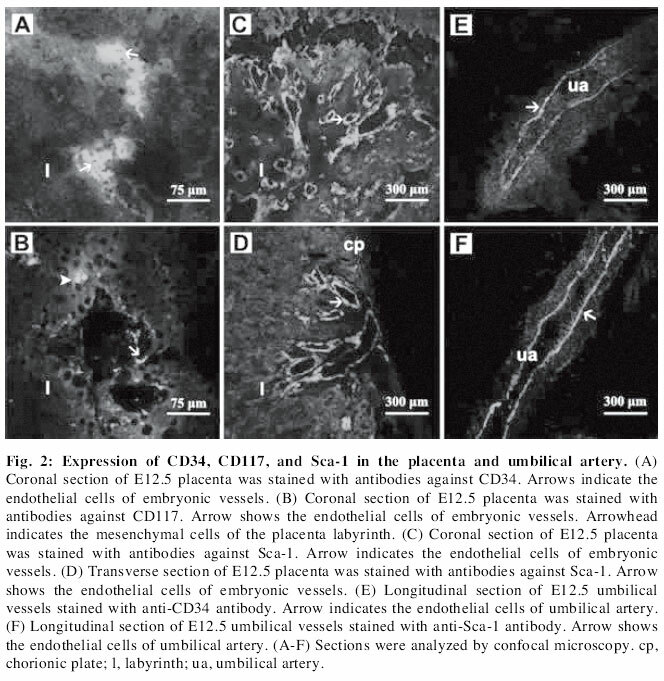 At E12.5, CD34 stained the endothelial cells lining the vessels in the placenta labyrinth (Fig 2A). 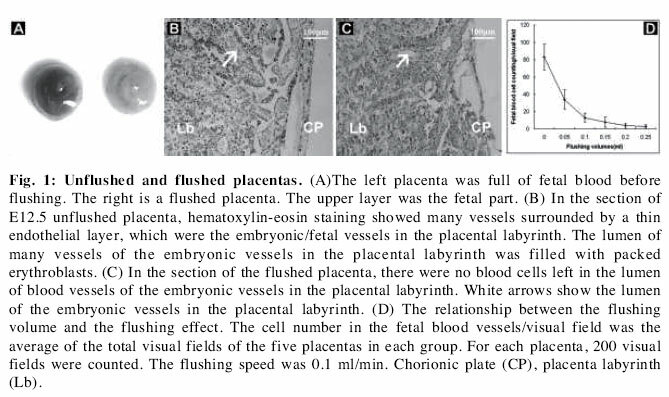 CD117+ cells were mainly found in the endothelial cells lining the vessels in the placenta labyrinth and the mesenchymal tissue of the chorionic píate and the labyrinth (Fig 2B). Most strikingly, a high level of Sca-1 expression was found in the embryonic vessels of the placenta (Fig 2C and D). Sca-1 expression was in the endothelial cells lining the fetal vessels that formed a network through the labyrinth región. It was also expressed by a few endothelial cells lining the vessels in the chorionic píate. At E12.5, in the endothelial cells of the umbilical artery, the expression of CD34 and Sca-1 could also be detected (Fig 1E and F), while the expression of CD117 could not be detected. First, we isolated and purified the placental cells with Percoll fluid. We then performed flow cytometric analysis to determine the number and phenotypic charactenstics of the purified placental cells in the placenta and placental blood. Placental cells were stained with antibodies specific for HS/PC markers: Sca-1(HSC marker), CD34 (endothelial and HSC marker), and CD117 (HSC and immature, hematopoietic progenitor marker). The percentages of the three cell populations in the total purified placental cells were 20.2%, 24.6%, and 26.2% respectively. For purified placental blood cells, the percentages of the three populations were 8.2%, 6.3%, and 6.5%, respectively. The concentration of positive cells in placental cells was higher than in placental blood. The absolute numbers of positive cells of CD34, CD117 and Sca-1 were 1.4xl04, 1.8xl04, and 1.8xl04 respectively in purified placental cells, and were 0.7xl04 0.5xl04, and 0.5xl04 respectively in purified placental blood (Table 1). The number of positive cells in the purified placental cells was higher than in purified placental blood. For the cell subpopulation of CD34+ /Sca-1 + , the percentage in purified placental cell (15.3%) was also higher than in placental blood (5.1%). In placental cells, 58% of Sca-1+ cells expressed CD34. 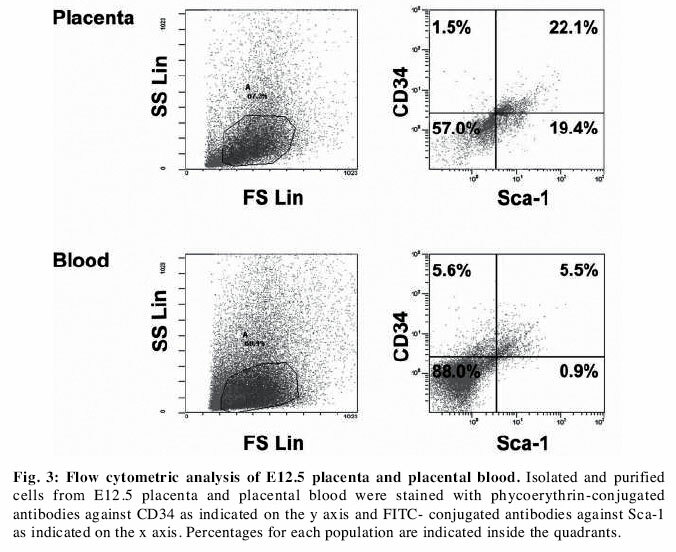 In placental blood, 78% of Sca-1+ cells expressed CD34 (Fig3). These experiments were carried out using E12.5, isolated and purified cell preparations. Three different types of progenitors - CFU-GEMMs (colony forming units, granulocytes, erythrocytes, monocytes, macrophages), BFU-Es (burst-forming units, erythroid) and CFU-GMs (colony-forming units, granulocytes, macrophages) - diagnosed from the colony phenotype, were scored separately on day 14 of culture (Fig. 4). CFU-GEMMs exceeding 0.5 mm in diameter (HPP-CFCs) were selected for serial replating. GEMMs were huge, and so qualified more adequately as HPP-CFCs. 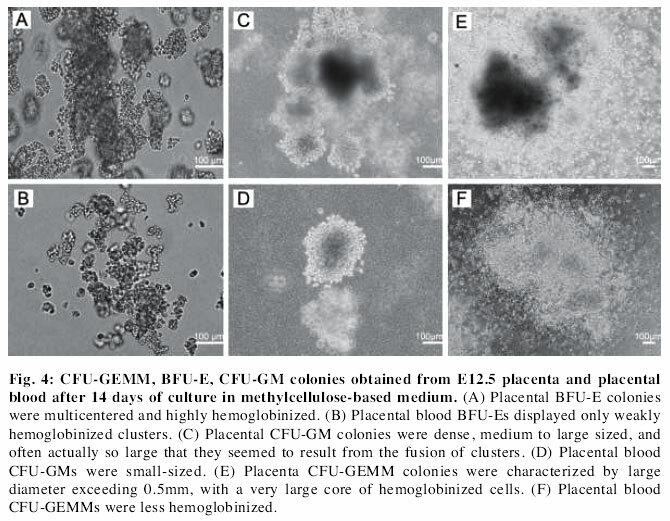 Compared to placental blood CFU-GEMMs, placental CFU-GEMMs appeared larger, denser, and contained more cells, with a very large core of hemoglobinized cells (Fig. 4E, F). In order to monitor the self-renewal capacity of hematopoietic progenitors in the placenta and placental blood, we replated the very large multilineage colonies derived from HPP-CFCs every 2 weeks for 2-3 months. At each replating, some very large colonies were again obtained. When the colonies were scored at 60 days, 35 CFU-GEMMs can be obtained from 105 replated placental cells. 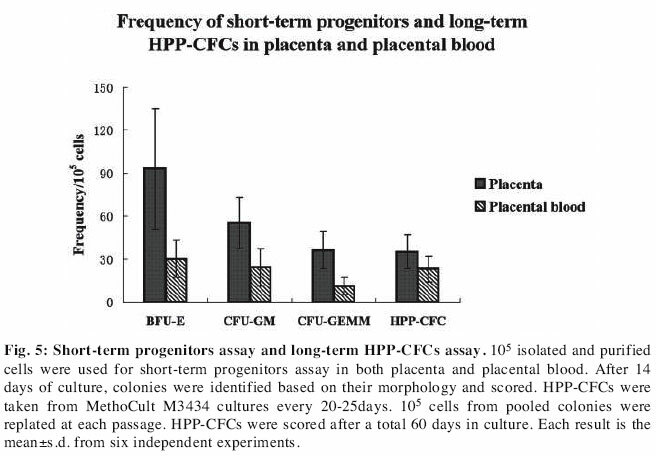 By contrast, HPP-CFCs could also be obtained from the placental blood and the frequency was about two-thirds of the placenta (Fig 5). Furthermore, the placental blood colonies were smaller than the placental colonies. Proper function of the placenta is essential for the development of the growing embryo. In previous studies, the placenta has not been regarded as taking part in fetal blood formation. Recently, a series of studies suggest that the fetal placenta is also a hematopoietic organ that plays an important role in establishing the HSCs pool during development. Alvarez-Silva et al (2003) examined the progenitors in E8-E17 placenta and found that the progenitors began to appear at the stage of 18 sp (E8.5) in the placenta. To examine the placenta for potent, adult-engrafting HSCs, Ottersbach and Dzierzak (2005) examined E9-E12 placenta (without the decidua or umbilical vessels). It was shown that no HSCs were found in E9 or E10 placenta. However, potent placental HSCs began to be detected at E11 and were present at high levéis at E12. As is known, the placenta labyrinth contains abundant fetal circulation blood. From E10.0 the definitive hematopoietic progenitors prefer to begin to freely distribute within the embryonic vasculature (McGrath et al., 2003). Long-term reconstituting HSCs appears in circulation by E12.5 (Christensen et al., 2004). Kumaravelu et al. (2002) found that at E12 there are 3.2 HSCs in circulation. In our study, we performed short-term progenitor assay and FACs with the flushed placental blood. The results showed the blood trapped in the El2.5 placenta contained a quantity of progenitors, which was about 1/ 3-1/2 of that in El2.5 placenta. Therefore, fetal blood cells trapped in the placenta should be one of the important factors to be considered in the study of placental hematopoiesis. However, how to clear fetal circulation blood in the placenta and detect the function of placental HS/PCs is still a problem. Consequently, we developed the technique of placenta flushing. In our result, there was no significant difference in flushing effect between 0.2 mi group and 0.25 mi group. It seemed that more flushing fluid than 0.20ml could not bring more fetal blood cells out. But remnant fetal blood cells in the placenta were not more than 2%, and the fetal blood could be nearly cleared out of the placenta with 0.2 mi flushing fluid. First, we observed the distribution of HS/PCs in the mouse placenta using the HSC surface markers. By immunohistochemical analysis, it was shown that high-level Sca-1 expression was restricted to the embryonic vessels of the placental labyrinth. Moreover, other HSC markers also were colocalized in the embryonic vessels of the placental labyrinth región. Furthermore, we performed immunohistochemical analysis of umbilical cord with the same HSC surface markers. It was found that the HS/PCs were also restricted to the endothelium of the umbilical artery. To examine hematopoietic activity, it is essential to first isolate placental cells with hematopoietic function. Continuous enzymatic digestión with collagenase and pancreatin was used to prepare placental cell suspensión. 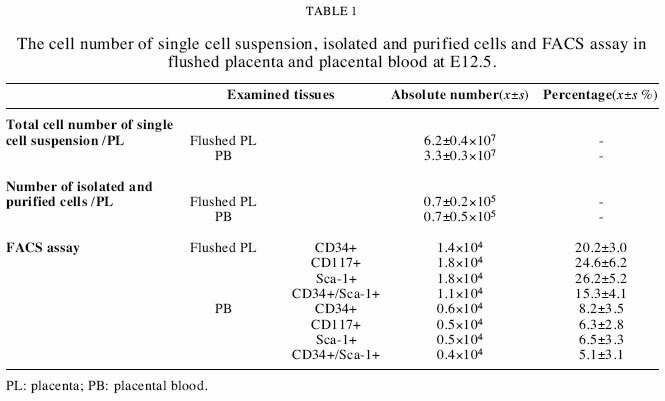 To obtain highly concentrated placental HS/PCs, the single cell suspensión was isolated and purified with Percoll fluid density gradient separation. After purification, the concentration of Sca-1+ cells could be raised to 26.2% at E12.5, while Sca-1+ cells represented only 3.09% of the unpurified total cell population at E12 in Ottersbach and Dzierzaks' report (Ottersbach and Dzierzak, 2005). Therefore, Percoll density gradient centrifugation method could be used to isolate and purify placental HS/PCs. The further analysis of the hematopoietic potential of the purified placental cells showed that the placenta of midgestation contained clonogenic hematopoietic progenitors, including CFU-GMs, CFU-GEMMs, BFU-Es, and HPP-CFCs. The murine allantois contributes the fetal vascular and associated stromal components of the placenta, including the umbilical vessels (Downs et al., 1998). At E8.5, the murine allantois makes contact with the chorion (Cross, 1998; Cross et al., 2003a, 2003b; Han and Cárter, 2001; Rossant and Cross, 2001). The allantois has been identified as a third site of hematopoiesis in the chick embryo (Caprioli et al., 1998). However, in murine embryos, it is not yet clear whether the allantois is hematopoietic (Downs and Harmann, 1997). Brandon M. Zeigler et al. (2006) investigated the hematopoietic potential of the two individual components of the murine placenta, the allantois and the chorion, prior to establishment of vascular continuity within the conceptus. Their studies demonstrated that the allantois and chorion, isolated prior to the establishment of circulation, have the potential to give rise to myeloid and definitive erythroid cells following explant culture. Catherine Corbel et al. (2007) examined the hematopoietic potential of the prefusion allantois and provided evidence that the allantois has hematopoietic potential per se. Since the embryonic vessels of the placenta were derived from the allantois, and the hematopoietic potential of midgestation placenta was mainly restricted to the embryonic vessels of the placental labyrinth, it may be reasonable to infer that the hematopoietic potential of the midgesation placenta was the continuity of the hematopoietic potential of allantois. In conclusión, both placenta and placental blood contain a quantity of HS/ PCs in the midgestation placenta. It is necessary to clear the placental blood out of the placenta in studies of the hematopoietic potential of the placenta. The midgestation placenta still possesses hematopoietia potential after the fetal blood is flushed out. We thank the members of the laboratory for assistance in various parts of these studies and for stimulating discussions, and Faliang Zhu for assistance with multicolor flow cytometry. We especially acknowledge the excellent assistance with microscopy provided by Dr. Yuji Guo. All other authors remain free from any conflicts of interest. * Corresponding author: Yingmao Gao, Wenhua West Road 44#, Jinan, Shandong, PR China. Telephone +86 (0)531 88380491. E-mail address:yingmaogao@hotmail.com.